The IMC Ladies' Wing in the year 1992-93, under the Presidentship of Smt. Kiran Bajaj, dedicated its programmes to the theme, 'Discover the Entrepreneur in You'. In a spirit of innovation, the Ladies' Wing and its members sought a close alliance with rural India to promote, support and honour the substantial work being done there in the field of entrepreneurship. 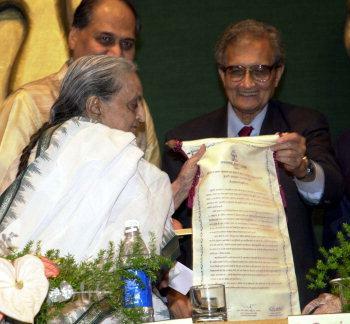 The year 1993 happened to be the birth centenary of Jankidevi Bajaj who had involved herself in the movement of rural entrepreneurship in more ways than one. It was indeed a welcome gesture for the Ladies' Wing when Bajaj Electricals Ltd. willingly offered to sponsor the Award. 2. Shri. Mukul Upadhyaya - Chief Executive Officer, Touchstone Advertising & Marketing Services. 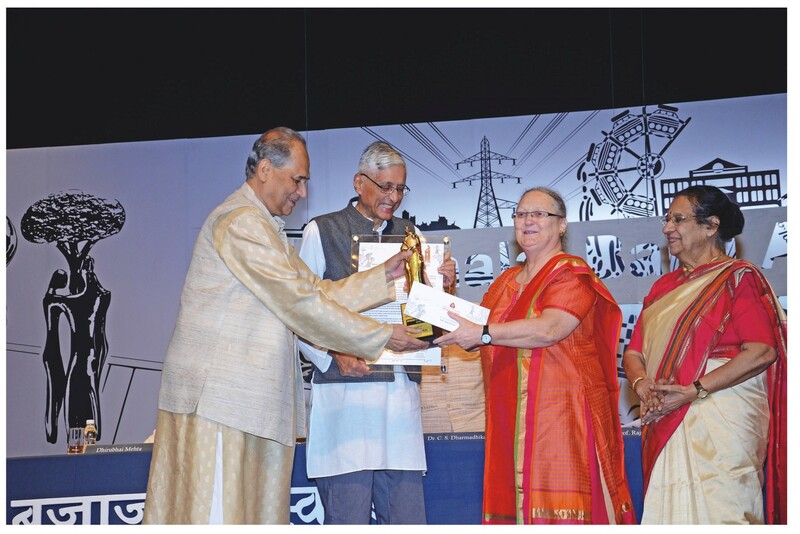 The Award is known as The IMC-Ladies' Wing Jankidevi Bajaj Puraskar. It comprises of a Cash Award of Rs.10,00,000/-, a Citation and a Ceritificate. To encourage and develop business entrepreneurship in rural India by recognising outstanding contribution of women who work for rural economic development. 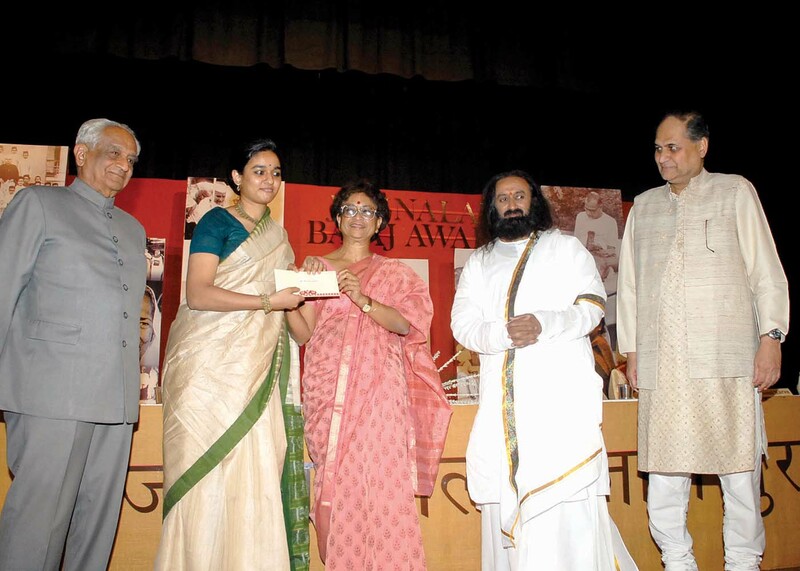 (a) The awardee should be a woman for rural India. (c) She should have made an outstanding contribution through entrepreneurship by which the rural community and society at large should have benefited. (a) The Ladies' Wing Awards Sub-Committee will appoint ever year a Panel of Judges to scrutinize the nominations received and select the awardee. One member nominated from among Bajaj Trusts will also be a member of the Panel of Judges. 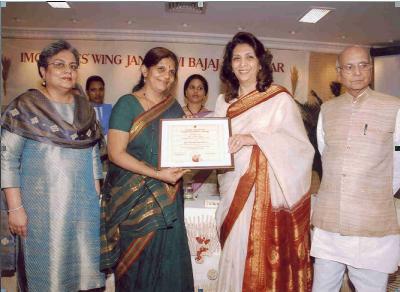 One member nominated from Bajaj family will also be a member of the IMC Ladies' Wing Awards Sub-Committee. (b) The Panel's decision will be final. The President and Vice- President if the IMC - Ladies' Wing will be the ex-officio members of the Awards Sub-Committee. (c) Nominations received in the previous years, but not selected for the Puraskar, can also be considered for selection. (c) Nominess short-listed may be asked to send photographs and/ or video CD of their work, to facilitate the decision of the Judges. (d) Panel of Judges may also consider suo moto any eligible woman for the Puraskar on merits, even if no nomination for her has been received. (a) The Award will be presented at a special function which will be organised by the IMC-Ladies' Wing on or around the date of birth (7th January) of Smt. 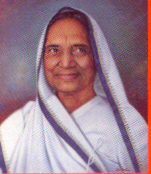 Jankidevi Bajaj. (b) An eminent person will be invited as Chief Guest who will also deliver a Keynote address on the subject of 'Rural Entrepreneurship among Women'. (c) The awardee will be given an opportunity to make a presentation. (1) Nominations sent by the heads of recognized institutions; other representative bodies and/or eminent individuals on their own initiative and/or if approached by Ladies' Wing, will be considered for the Puraskar. (2) Self-nominations will be accepted. (3) The sponsors should send factual information pertaining to the nominee in the format prescribed by the IMC- Ladies' Wing. (4) While making nominations, the sponsors should take into consideration the sum total of the work done by the nominee(s) during the year/years preceding the conferment of the Award. (5) The individual who gets this Award will not be considered again. (6) The Ladies' Wing may defer or withhold conferring the Award if, in the opinion of the Panel of Judges, no nominee is found suitable for receiving it. 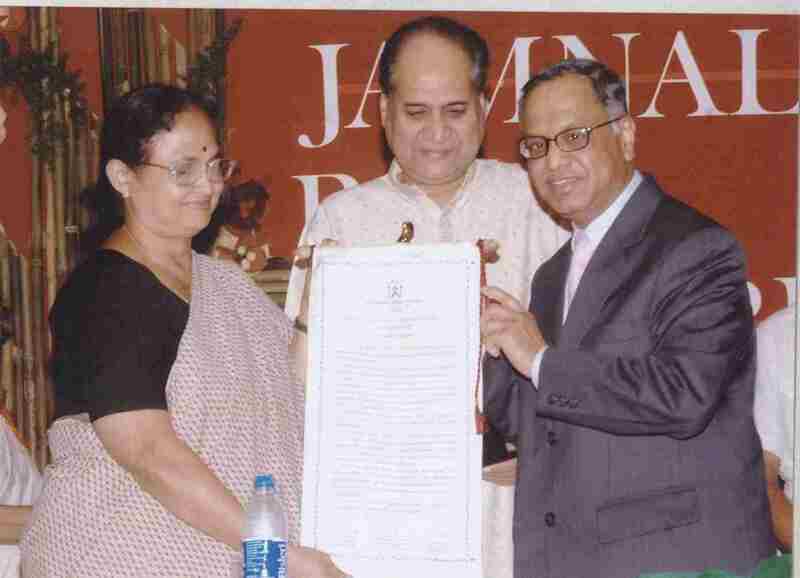 In 1980, Jamnalal Bajaj Foundation constituted a special award in memory of Jankidevi Bajaj, for women workers doing commendable work in the fields of child welfare and women's emancipation as also in constructive Gandhian work. This award of Rs. 10 lakhs is given every year. Jankidevi Bajaj Trust is engaged in various social activities in Udaipur. This Trust was established in 1987. The main objective of this Trust is to act as a catalyst for the participation of the rural community in improving their quality of life, eliminating poverty, empowering women, development of human and natural resources, promoting ecological balance, etc. Presently this is done in 24 remote and backward villages in Khed and Maval talukas of Pune and Paithan, Gangapur talukas of Aurangabad. 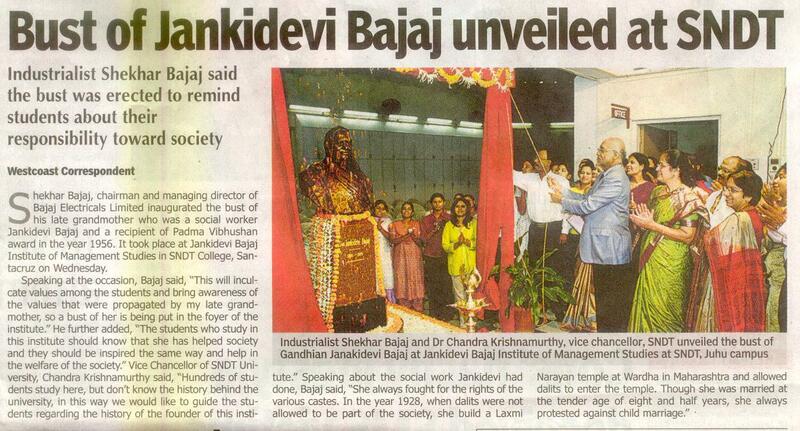 JDIMS was established in August 1997, with a donation from the Bajaj Group, at the Churchgate campus of the S.N.D.T. Women's University. 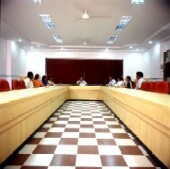 It is a Center of Management Studies and the Postgraduate Department of Management Education of the S.N.D.T. Women's University. 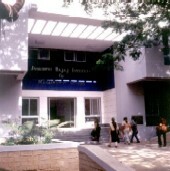 Since July 2001, the institute functions from its own building at the Juhu Campus of the S.N.D.T. Women's University. The institute offers a variety of full time and part time professional courses at the Masters level and Postgraduate Diploma courses in management specifically for women. With these, JDIMS seeks to provide much needed training to a growing number of women managers who are increasingly coming to the forefront of global business. Within a short span of 3 years, it has made a mark for itself in the field of management education in the State. It has been awarded a B+ rating by the AIMA Business India Survey. It was established on 20th June 1962. Today it is the principal Science College in Wardha with 1600 students from Junior College to Senior College. In addition to normal Science stream subjects like Mathematics, Physics, Chemistry, Botany, Zoology, Microbiology, Electronics and Computer Science, it also offers Minimum Competency Vocational Courses. The college has a teaching staff strength of 60.